The public interest in the World Games in Duisburg was great; more than 500.000 people attended the various competitions and for several competitions additional entry tickets had to be printed. Also, the press provided good coverage of the World Games 2005 in newspapers, radio and television. The TV signal was produced by the Westdeutscher Rundfunk WDR and was well broadcast on European TV stations as well as on various channels outside Europe. In their publicity campaign the Duisburg Organizing Committee had used the slogan Germany can do it. Duisburg shows it! , a slogan that the participants certainly agreed with. 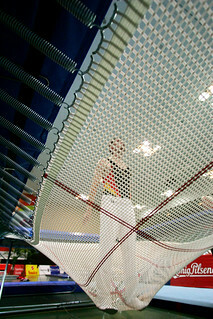 The World Games 2005 were successful in every respect and the organizers had set the standard for future events. Duisburg is a city in the state of North Rhine-Westphalia in Germany. With one of the world's biggest inland harbours and good railway, road and air transport (Düsseldorf Airport), Duisburg is currently one of the biggest logistic centres in Germany. The oldest places of the city dates back to the first century. The city was located along an important medieval trade route at a crossing on the River Rhine. Due to the town's favourable geographical position, Duisburg became a member of the Hanseatic League. The industrial revolution in the 18th century made Duisburg an industrial centre. Big industrial companies such as iron and steel producing firms (Thyssen and Krupp) influenced the development of the city. Simultaneously with the closure of the coalmines, the “heavy” industry in the Ruhr area ceased to exist. From productive industry, Duisburg had to change its major economic element to transport and it is currently a major logistic centre in Germany. However, the König Brewery which was founded in 1858 still exists and produces the König “Pilsener”. It was also one of the major sponsors of the World Games 2005. Sport is a vital element in Duisburg society. There are many kinds of sports clubs in the city. The most important sport in Duisburg, as in many German cities, is football (soccer). The city’s major football club is MSV Duisburg. 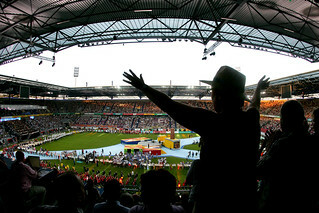 The renewed MSV Arena was used for the Opening and Closing Ceremony of the World Games 2005 in Duisburg. In 1987 the city had organized another major international multi-sport event, the Universiade, the main event for university athletes. 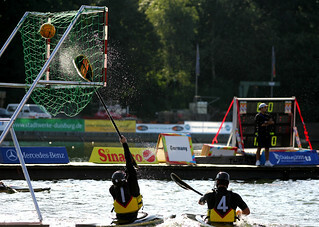 The Regattabahn in the Wedau sport area is a venue for many international rowing and canoeing competitions. The elegant event logo of the Duisburg World Games resembles the curves in the river Rhine near Duisburg. The flowing curves of river are supplemented with the World Games logo and the colours of the national flag. The organizing committee of Duisburg invited von Mannstein, a marketing and design company, to create an all-embracing concept for the publicity campaign. The two main elements of the design were the overlaying winding colour shapes and the name “faszinationen”, a clever contraction of the German names for ‘fascinate’ and ‘nations’. Duisburg used the graphic design in the overall campaign which also included the slogan “Germany can do it, Duisburg shows it”. 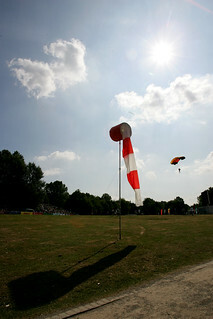 The mascot of Duisburg was given the name Allwin, like the German boy’s name Alwin, but through the slight change in spelling it was also the slogan for the games, indicating that “all win” in this event. 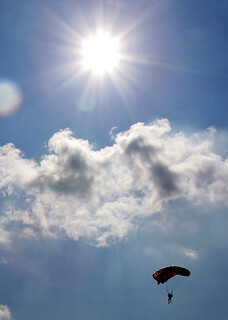 The design of the event logo, as well as the colour design of Professor Coordt von Mannstein is used in the mascot of Duisburg. The efforts of the von Mannstein company are clearly visible in all publications of the Duisburg Organizing Committee. The various visual identifications used at the Duisburg event were very well received by the media and the public.